Since they burst onto the scene in 2013, K-pop boy band BTS has rarely taken a break. Over the last few years, they released their genre-bending album trilogy The Most Beautiful Moment In Life, and quickly followed up with their new release You Never Walk Alone this past February. 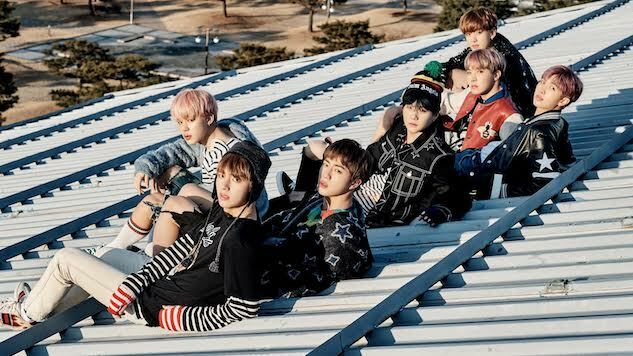 The band’s seven members—Jimin (vocals/choreography), Rap Monster (rap), V (vocals), J-Hope (rap/choreography), Jin (vocals), SUGA (rap) and Jungkook (vocals/choreography)—have made waves at home and abroad, cracking the iTunes Top 10 charts with “Spring Day” and making fans out of artists like Charlie Puth and Wale. But BTS still isn’t done, the band is currently travelling the globe on their sold-out Wings tour. Paste talked with the boys of BTS about K-pop style—from dressing for themselves to Kanye. Paste:When did you first paying more attention to style or fashion? Rap Monster: I’ve been buying clothes online since junior high! SUGA: I first paid attention to fashion when I was around 15, but I don’t really care much about it these days. J-hope: I think when I was about 18 when I moved to Seoul, getting ready for the debut. I saved some money to buy used brands and style up myself. Jimin: I first started to pay attention to fashion after my debut as BTS in 2013. Paste: Do you feel that you dress more for yourself or for others? Rap Monster: I usually dress for myself, whenever I feel like wearing something but I do refer to trends from time to time. I’m so into Japanese work wear such as WTAPS and Neighborhood. J-hope: I’d be lying if I say I only dress for myself. I try to dress according to fashion trends that suit me and go along with me per season. Jin: I often dress for others, but most of time, I’d like to dress for myself because I prefer simple designs. Jimin: I don’t really mind trends of fashions, and I just choose whatever I like for the day to dress for myself! V: I usually have my own styles and dress for myself. Jungkook: I always dress MYWAY! Paste: Do you dress any differently on stage than you do in your day-to-day life? Rap Monster: Totally. As BTS and on stage, I dress up to emphasize various details highlighted by lightings and cameras. But I dress down in my day-to-day life, so I look like a different person. SUGA: I prefer comfortable clothes in daily life. J-hope: I dress up with colorful and brilliant garment to maximize the impact of performance. We also wear bold accessories on stage. If you look close, you’ll notice that each in-ear wireless mic has a customized design per BTS member. Everyone has different designs. V: I wear a t-shirt and knits in day-to-day life. Jungkook: I absolutely dress down for daily fashion. Paste: What is your biggest style inspiration? Rap Monster: My attitude. Mindset. Mood. J-hope: I love trying new stylings, inspired by my favorite artists. Jimin: I sometimes get inspired by BTS stage garment and often get some styling ideas from other BTS members. It really depends on how your day goes. Paste: In your opinion, what movie, TV show, music video, etc. had the best or most iconic style? Rap Monster: Kanye West’s “Runaway” and all of Mercy’s music videos. J-hope: joey bada$$’ Land of the free. I think it is the best in terms of styling and direction. Jin: The Devil Wears Prada is the most iconic when it comes to fashion. Andrea awakens and finds out about fashion throughout the movie. V: I loved how Domhnall Gleeson dressed up in the movie About Time. It is my personal favorite. Jungkook: My favorite iconic style is DOPE by BTS! Paste: What’s the biggest fashion mistake you’ve ever made? Rap Monster: I had numerous fashion mistakes before and after the debut as BTS, but I have less and less now! SUGA: Too much fashion of everything. Jin: Pink tops, pink trousers throughout the week. What was I thinking? V: How I dressed like a year before. Jungkook: I once wore a pair of bright red sneakers with a grey track pants. Paste: In general, how do you approach the visuals that you use with your music, such as music videos or album art? Rap Monster: I try to visualize my music and concept in terms of color and mood so I can come up with right ideas. SUGA: I first pair with the music concept and then tune in with other visual elements. Jin: I always focus on concepts. Then I try to find the right visuals under the given concept. Jimin: I tend to think about how choreographed they are together, music and visuals, and approach them as total concept. Paste: Why do you think music and fashion are so intertwined? Rap Monster: Music and fashion are intertwined because they are someone’s attitude and minds themselves. They speak for people on behalf of words. SUGA: Music and fashion have to have their own styles. It’s a must. J-hope: You get the positive, good synergy when combine music and fashion. Think about music videos and fashion shows. They are greater than what they are added or combined. Jin: Music and Fashion are so intertwined because both need stages to shine. Jungkook: Music and fashion complement one another when combined. You feel way different before and after watching a video of a song. It is similar to such experience. Paste: What’s something you’ve never been bold enough to wear? Rap Monster: I’ve done pretty much everything except for wearing skirt. But I don’t think I never will. Jin: Very colorful, showy garment. Jimin: I’d like to try more bold styles because I haven’t done much yet. Jungkook: Long hair. It’s on my bucket list. Paste: Why do you think fashion is important? Rap Monster: It represents who you are without a word or any description. SUGA: Fashion tells about who you are from external point of view. J-hope: Fashion kind of defines your unique color. It is even more important to music artists like us, of whom style and identity is critical in professional terms. Jimin: Fashion describes and defines you. People can know you better through the fashion. V: Fashion is one of the most important part of my life. It means a lot to me and I get to think about many things through fashion. Jungkook: Fashion sort of draws you as a person. You can make yourself different and unique by wearing this and that. That is exactly why BTS come back with new, different fashion with unique concepts.